“On a mountain above the clouds once lived a man who had been the gardener of the emperor of Japan. Not many people would have known of him before the war, but I did. He had left his home on the rim of the sunrise to come to the central highlands of Malaya. I was seventeen years old when my sister first told me about him. A decade would pass before I travelled up to the mountains to see him. Judge Teoh Yun Ling has retired from the Kuala Lumpur Supreme Court and is returning to Cameron Highlands for some unfinished business. Yun Ling is haunted by her past, the only survivor of a unknown Japanese internment camp in the jungle, her older sister Yun Hong among the dead. And troubled by her future, faced with the terrifying prognosis of aphasia which will take her memory and her language. So she begins to tell her story. 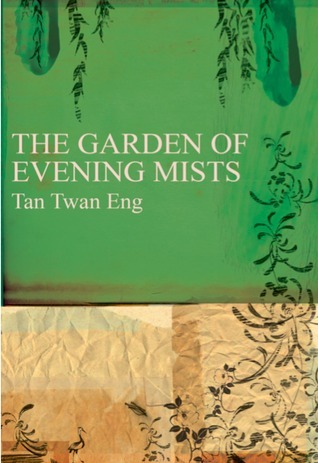 After the war was over, Yun Ling had hoped to create a Japanese garden in memory of her sister who loved such gardens, and travelled to Cameron Highlands to learn from Aritomo, the creator of the garden of evening mists and formerly the Japanese emperor’s gardener. He eventually accepts her as his apprentice and together they work on his garden and become more than friends. This book brought my secondary school history texts to life. And this is something I’ve never been able to say before. So it was kind of fun for me to read about the Emergency and familiar names from the British in command like High Commissioners Gerald Templer and Henry Gurney (who was assassinated by the communists). Of course I am the kind of person who actually gets excited about things like history! Of course if don’t feel that way, it doesn’t mean that this isn’t the book for you. It’s got great characters, gorgeous writing and a rarely written about, picturesque setting with a Japanese garden. I agree that this brought history to life. I wish I’d studied books like this at school instead of all the dry text books. Glad you enjoyed it as much as i did. Yeah perhaps I would have stuck with history at A level (instead of giving it up after the first year of junior college) if the texts were more interesting! I remember an immense volume on the history of China!! I am glad you enjoy this book. I studied those textbook about the history too and the culprit of it all was the guy named Chin Peng! I haven’t been to Cameron Highlands since the early 80’s, so definitely I should go back there one day. What about you? Have you been to Cameron highlands? I definitely remember visiting Genting Highlands, but I’m not sure about Cameron Highlands! I do recall my mum talking about it before, how it’s nice and cool there. Perhaps one day when I’m back in that part of the world, it will be nice to visit! Yeah I remember Chin Peng, and that’s partly cos one of the teachers in my secondary school kinda looked like him! haha!